Precision and lyrical beauty. 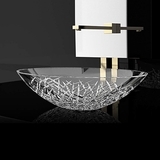 The Murano Calla luxury vessel-sink, distinctive style combined with unique sculptural details this masterpiece is the "Michelangelo" of all sinks. 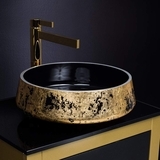 This luxury vessel-sink made with elegant and timeless materials, has the fluidity of the finest elements and reflects an incredibly revered work of art. 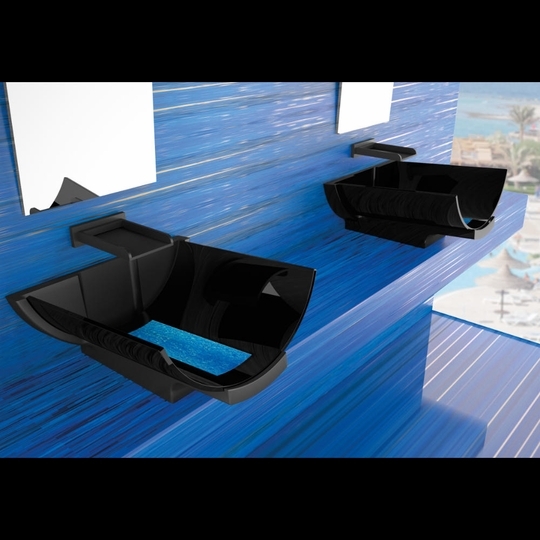 The Murano Calla has an ultramodern style with an exaggerated natural half pipe curve and is architecturally designed with a slight angle, to decline the water flow to the back of the vessel. 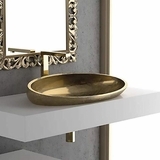 This luxury vessel sink is in a class of its own and will compliment a contemporary or transitional design style best. 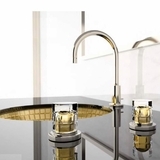 Made out of luxurious Murano Glass and enhanced with lustrous colors. 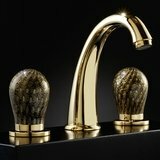 The Murano Calla is available in designer inspired colors: Black|Bluemarine, Black|Gold, and Black|Silver. 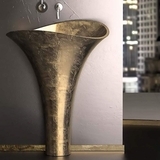 This vessel-sink represents timeless luxury, living without limits and having peace and tranquility at your fingertips. Countertop installation ensures this sink will stand out in your bathroom as a striking focal point. Murano Glass is one of the most exquisite and timeless artisan design materials, sculpted and polished by hand to give a distinguished contemporary elegance. 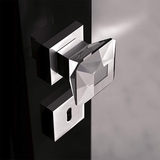 Furthermore, Murano Glass is unique and prestigious making it practical for most luxury design applications.